Calling all superheroes! Join us January 19 from 2-4pm to show off your best superhero costume and enjoy a day filled with family fun, including meet and greets with superhero characters, face painting, crafts and more, sponsored by Keller’s Creamery. 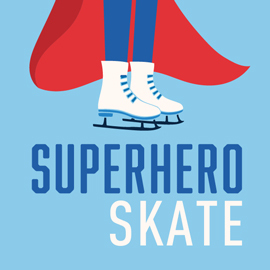 Then, for even more fun, lace up your skates and "fly" across the Rothman Orthopaedics Ice Rink. Admission and skate rental fees apply. Temple University students from Alliance of Heroic Hearts, a non-profit organization with the sole purpose of bringing out the hero in ordinary people, will be on-hand to distribute free superhero capes emblazoned with the Temple “T” logo. For more event details, visit CCDParks.org. Follow @CCDParks on twitter for event updates and share your favorite event photos on Instagram with @CCDParks and #DilworthPark. FREE weekly ice skating workouts led by professional trainers. Enjoy drink specials and try your hand at Quizzo hosted by Johnny Goodtimes for a chance to win free tickets to the Vikings: Beyond the Legend exhibit. Enjoy a seasonal menu and specially-priced EFFEN Vodka cocktails, Bud Light draft beer and a selection of wines. College students pay $2 admission* to skate at the Rothman Orthopaedics Rink with student ID. Skate rentals not included. *Cannot be combined with other offers. Enjoy great tunes, food and drink at Karaoke Nights powered by Live Nation. 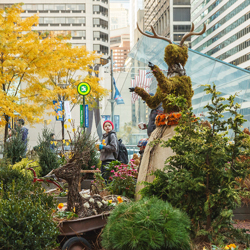 Stroll through the Wintergarden at Dilworth Park, a winter-inspired garden, located on the Albert M. Greenfield Lawn. Children and adults will delight in discovering picture-perfect moments amid fun topiaries, twinkling lights and seasonal plants. TD is proud to support Wintergarden to create a healthier and more sustainable Center City. For more information about Wintergarden features and hours, visit DilworthPark.org. CCD Restaurant Week, presented by Marker’s Mark Bourbon and El Tesoro Tequila and supported by OpenTable and Lyft, is in full swing. Now through January 25, dine on three-course dinners for $35 per person and three-course lunches for $20 (excludes tax, gratuity and alcohol.) There are nearly 130 participating restaurants to choose from, including new additions Bai Wei, Sedition, Fat Salmon and Giuseppe & Sons. 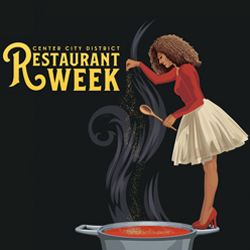 Visit CCDRestaurantWeek.com to see the full list of participating restaurants, make reservations today via OpenTable and enter for a chance to win 52 Center City restaurant gift cards and a $500 TD Visa® gift card for a Center City shopping spree. Follow @PhilaRestWeek on Twitter and Instagram for the latest updates.